This post contains reviews of books that were provided to me, either in e-book or physical format, for my consideration. Specific books I received are indicated using [PR copy]. This post also contains affiliate links. Well, I managed to squeeze in a ton of books this month especially during the last week or two, so I’ve decided to split them up into two posts. Also, I leave for California today and the odds of me reviewing the other half of the books any time soon…are limited. So let’s start with the 8 I have reviews of. I heard so many good things about Turtles All The Way Down by John Green and despite having my boyfriend order me a signed copy for my birthday, I somehow never managed to pick it up in 2017. I finally managed to read the book about 6 months after its release and I definitely regret not getting to it sooner. This well-written novel tells the story of sixteen-year-old Aza who works with her best Daisy who investigate the disappearance of billionaire with a hundred-thousand-dollar reward. 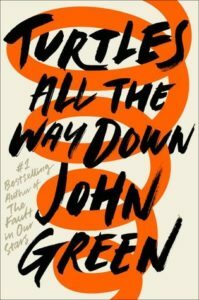 Turtles All the Way Down definitely has the Green quirk and charm, and even though the characters tend to sound like characters rather than real people, he really captures the emotion and struggle that Aza is facing. In particular, the book discusses what it is like to live with OCD and anxiety a way that felt very authentic. Although the storyline itself was a bit ridiculous in concept (especially the whole tuatara thing), the emotion and and voice behind it is what really makes the book succeed. The pace of the book is also excellent, and I really loved the way Green tackled teenage friendships and relationships. Green books get a lot of hype, but I really enjoyed Turtles All the Way Down and I’ll definitely continue to pick up his novels in the future. 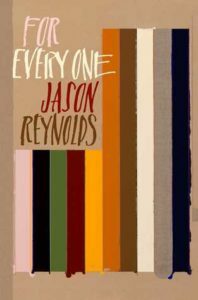 For Every One by Jason Reynolds is a very quick read, a spoken word poem compiled into a slim volume that features inspirational words anyone with a dream they are struggling to achieve. I listened to the audiobook–which is narrated by Reynolds, whose novel, Long Way Down, I read and loved earlier this year–while reading along with the book. I highly recommend listening to this book, the poem was originally delivered as a speech and it feels so much more powerful delivered that way, although the formatting of the book is also really interesting and well done. The audiobook also has a bonus excerpt from Reynolds about writing that was really interesting. Overall, Reynolds’ writing is straightforward and motivational, and while his message can be applied to everyone I think his writing is especially important and well-suited to teens. 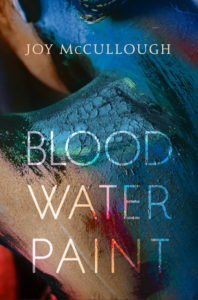 I really love novels in verse, and I also really love art, so I was especially intrigued when I learned of Blood Water Paint by Joy McCullough, a recently released novel-in-verse based on the true story of the painter Artemisia Gentileschi. I wasn’t familiar with Artemisia before McCullough’s book, but she was a teenage girl who painted under her father’s name in the 1600s. The book is interspersed with the stories of Judith and Susanna, told by Artemisia’s mother, who passed away when she was 12. I really love the premise behind Blood Water Paint and Artemisia is an incredibly strong main character dealing with a really difficult life, resulting in a lot of intensity. It is a really brutal and not happy story at times, which can be upsetting to read but felt honest. That said, while the emotion behind the book was strong, possibly because of the format, I often felt like some of those historical details to really set the time and place were lacking. My major issue was that I felt a disconnect with the passages about Judith and Susanna in the book, I didn’t feel like they transitioned well with the rest of the book and I honestly was tempted to skip them so I could continue on with Artemisia’s story. That said, I overall I did like Blood Water Paint and I’d certainly be interested to see what McCullough writes next. It’s so much easier to do recaps when they include books I’ve already read and reviewed, but since that’s such a rarity I don’t think I’ll have that convenience very often. 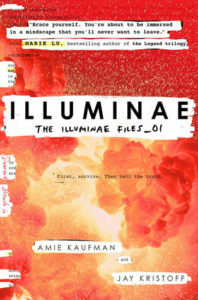 That said, after ordering paper copies of the Illuminae series by Amie Kaufman and Jay Kristoff I had to reread the first book (which I reviewed here) before continuing on with the series. I actually read it in ebook format last time while listening along to an audiobook and you definitely need a paper copy to properly appreciate the amazing formatting of this book. 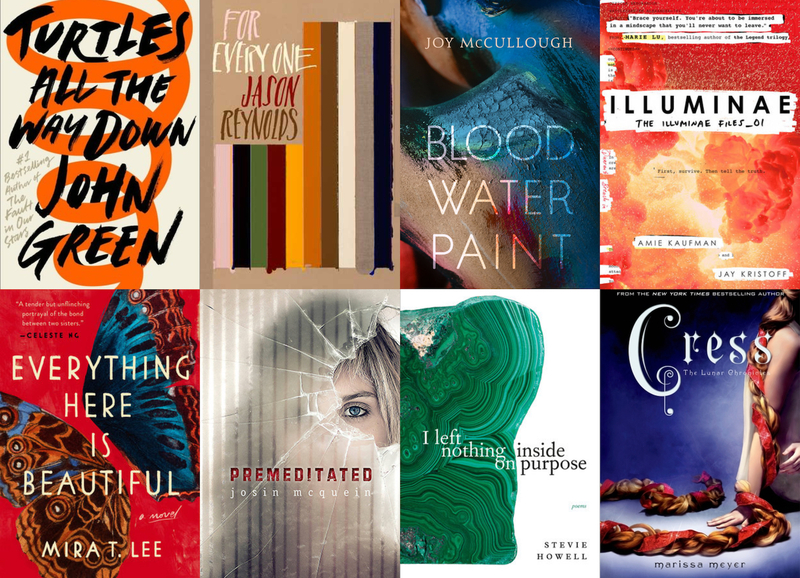 Even though I never reread books, I loved Illuminae so much I had to make an exception to that rule, and it was just as good as the second time and a definite reminder of why it made it into my top 10 books of 2017. 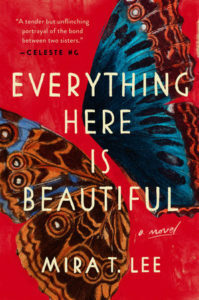 I rarely do this, but I actually knew nothing about Everything Here is Beautiful by Mira T. Lee except that it was blurbed on the cover by Celeste Ng, whose novel Little Fires Everywhere I absolutely adored last year. Similar to Ng, Lee’s novel is a quiet literary fiction about family life, but in this case the story is about two sisters, Miranda and Lucia. After their mother dies, Miranda feels responsible for her sister, who begins to hear voices. The focus of the novel is Lucia’s struggle with mental illness and her relationships with other people. I started off borrowing an audiobook of Everything Here is Beautiful from the library but I actually preferred Lee’s novel when I sat down with a hard copy instead and let myself slowly absorb her words. There are a lot of perspectives in the book including both first and third person, and while I wish the book had stuck to first or third person, the multiple perspectives do help the reader get a really broad perspective on Lucia. Everything Here is Beautiful is really a heart-wrenching story, emotional, and beautifully written story about what it is like to to be a person with a mental illness but also, what it is like to love that person. 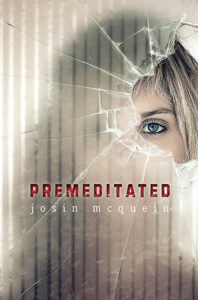 I hardly even want to review Premeditated by Josin L. McQuein because I’m so annoyed by a book I wanted to read for the last 5 years. Honestly, I’m sure my expectations were too high based on that wait, but I actually first heard about this book before it was published because McQuein wrote a description that was well-circulated prior to the book even being published. I even read two middle grade science fiction novels by McQuein, and loved the first one, Arclight, so much it made it into my top 10 books of 2017. Premeditated is the story of Dinah, who, after her cousin Claire attempts to commit suicide and ends up in a coma, finds her diary. Dinah knows exactly who is responsible for what happened to Claire, and she is going to make him pay, so she dyes her hair, removes her piercings, and unrolls at school with the “killer”. Even though the start of this book is really intriguing, very soon it becomes cheesy and not at all suspenseful. I thought Dinah was supposed to be undercover, but she immediately reveals her story, and watching her pretend to be “somebody else” (ie: somebody who is friendly? I’m not quite sure) is just painful. The ending of Premeditated is so predictable and since there are no actual twists it just becomes about the characters. Unfortunately, I really didn’t like most of them. In particular, Dinah was just annoying and full of herself. Of course, she knows Claire better than anyone else and telling anyone (ie: an adult) what’s going on is not nearly as fun as her little revenge mission. I read a lot of YA even though I’m outside the target audience, but very rarely does a book make me feel as old as this one. It’s just packed with bad ideas. I think I would probably still give McQuein another try because I really enjoyed Arclight but it will take awhile for the disappointment from this book to wear off. I love reading poetry but I certainly find it harder to review than a novel, it just feels so subjective and personal. I loved the title and message behind I left nothing inside on purpose by Stevie Howell, but the poems themselves I often had a difficult time connecting with. It’s a quiet collection filled with thoughtful pauses, examining moments and places. 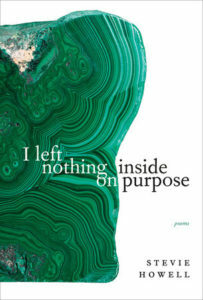 While it wasn’t a collection I fell in love with, I left nothing inside on purpose is a short book interspersed with beautiful phrases, so if you are looking for a new book of contemporary poetry to read, I would consider this. I absolutely adored the first two books in the Lunar Chronicles, Cinder (reviewed here, but also featured in my top 10 books of 2017) and Scarlet (reviewed here) so I was thrilled that book 3, Cress by Marissa Meyer, continued to impress. If you are thinking of reading these books, I highly recommend you pick up the audiobooks, which are narrated by Rebecca Soler and absolutely fantastic. This science fiction young adult series is a mix of fairy tale retellings featuring a cyborg Cinderella story and a planet in grave danger. I don’t want to give any spoilers to the previous books, but Cress picks up right where Scarlet left off, and as you can likely guess from the cover which new fairy tell this book draws inspiration from. With the introduction of even more characters, the book gets even longer (about 550 pages) and there is less time for some of them, in particular Scarlet has a much smaller role in Cress. While I didn’t like Cress as much as Cinder and Scarlet because of her obsession with falling in love, her personality definitely started to improve as she matured throughout the book. 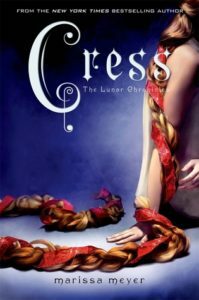 It was also really fun to see how the characters interact, and the plot of Cress was jam-packed and full of intensity. I can’t believe I am nearing the end of this series, but luckily I have the novella Fairest to pick up before digging into the finale, Winter to see how things turn out for this gang of characters I don’t want to say goodbye to. I had such a good reading month in May the annoying part is that I didn’t keep up with my reviews at all, so I’ll be back eventually with the rest of them. In the meantime, let me know if you’ve read any of these, and if not, have you read anything you’d recommend lately?